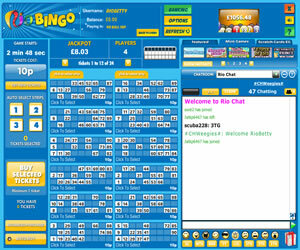 Rio Bingo exploded onto the Internet in April 2014, another brand from the Mandalay Media company. On hearing the name for the first time we were reminded of the animated film about a macaw and low and behold, such an animal adorns the home page. The second thought was Rio De Janeiro – home to the World Cup 2014 – there was also a football reference on the landing page when the site launched. In 2016 Rio is set to host the Olympics too, no doubt the home page design will incorporate this sporting event too. 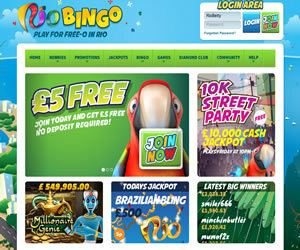 The landing page for Rio Bingo is certainly inviting with a scrolling banner telling of the welcome offers for new players, big money jackpots also being advertised and a little spiel about what the site has to offer. Is it all as exciting as the home page promises? Registration to the site took just a couple of minutes and then we were ready to play (with the free £5 on offer at launch in our account instantly because we included our financial details). It’s off to the lobby for us to see exactly that the brand has to offer…. Stepping into the lobby you won’t feel lost, the navigational tabs and general layout is the same as with many of the brands that are standalone using the 888/Cassava software. Horizontal nav tabs tell of 90 ball and 75 ball games along with instant wins and of course, what Mandalay do really well…free bingo! Once you have chosen which tab hosts the game of your choice you’ll find even more details. You can see the hosts name, the room name, the ticket price, jackpot and number of players – all useful in helping you make an informed decision as to which suits your gaming needs. 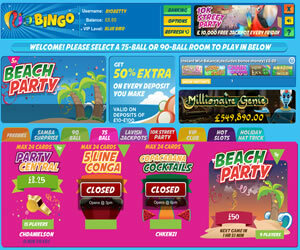 When it comes to jackpots Rio Bingo have an abundance! There is a weekly pre-buy game on offer – some for cash prizes, others tangible prizes and of course, Diamonds and loyalty points can be won too. In addition to that there are the usual progressive jackpots on offer throughout the rooms. Monthly promotional games boast the biggest prize pools though. 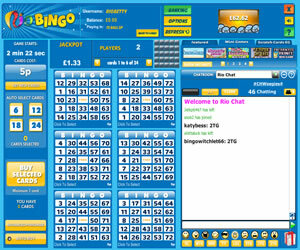 Rio Bingo offers three variants of the bingo game at their site; 75 ball in two varieties (pattern and multiline) and 90 ball bingo. Alongside these are an abundance of slots and instant win games including casino table games. The wagering requirements are 4x the deposit + bonus received. However, you can withdraw before meeting these requirements so long as you have deposited at least £30 in your account and have made a least one bet. Should you withdraw before meeting the wagering requirements then any bonus funds in your account will be lost.